I spent most of the week after my exam lounging on the couch, reading The Bird’s Nest by Shirley Jackson. It’s the story of Elizabeth, a young woman with multiple personalities, her unmarried (lesbian?) aunt who controls her inheritance and drinks a lot of brandy, and the doctor who tries to sort out the different selves living in Elizabeth’s mind. In telling the story, Jackson uses the slippages and quick cuts between voices and scenes that I think makes her writing seem so modern and so cinematic. 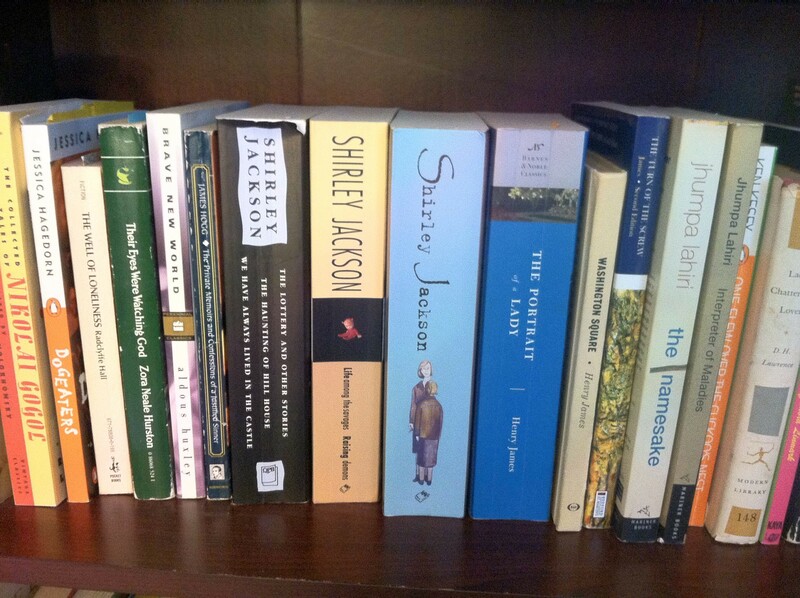 Shirley Jackson is one of those writers who has taken up residence in my brain as well as my bookshelves. My first encounter with her work was when I bought a volume containing The Lottery and Other Stories, The Haunting of Hill House, and We Have Always Lived in the Castle from the Teen People Book Club. The blurb in the catalog hailed The Haunting as the scariest novel of all time according to other horror writers. That’s a tall order and, honestly, the book was not what I anticipated. The Haunting is not scary in the way that I expected at 15 years-old but it’s scary in the way that it unsettles the reader’s ability to grasp reality. Shirley Jackson makes normalcy seem unhinged. That’s a more mature kind of scary. While I enjoyed that collection well enough, it was the next selection that really won me over. I ordered Life Among the Savages and Raising Demons. The latter isn’t great, but Life Among the Savages is one of my favorite books. In it, Jackson writes about raising her expanding family in a fixer-upper house in the suburbs. It’s mundane enough subject matter, but she brings to it the shimmer of her career writing psychological thrillers and a biting sense of humor. When I imagine myself as a mother, I imagine myself as Shirley Jackson in this book. (I don’t know what that says.) The Night We All Had Grippe is the stand-out piece in the collection, in my opinion. She creates a puzzle out of the nighttime migrations of her family during a bout of illness, treating uncomfortable sleeping arrangements like a full-on mystery and addressing the reader with a wink. Jackson is the type of writer I’d like to be, taking the ordinary and making it modern, unsettling, frightening, or funny. I read a lot, but Jackson easily cracks my Top 5 favorite writers. I was never asked to read Jackson’s writing for school and I had never known anyone else who read her before, so from the Teen People Book Club into my mid-twenties, those two volumes of her work stood on my shelves like my own little private joy, albeit gathering dust. I don’t remember how, but one day I was talking to my friend and classmate Megan about books, and Shirley Jackson came up. I’m sure if I’d looked, I could have found someone else who liked Shirley Jackson, but stumbling over our shared love of her writing weirdly felt like one of those Small World moments. “Oh, you know Shirley? Me too!” exclaimed on a plane or something. It was like sharing a secret. I suspect that part of why I enjoyed Jackson’s writing so much was because I was never asked to analyze it. I never studied it, wrote about it, or talked about it. I just enjoyed it with a purity that is sometimes hard to grasp when you’re being trained in textual analysis (ever watch a movie with an English major?). And, like I said, I never looked for other fans of hers. It was all built on joyous laziness. Megan is especially good at paying attention to literary form and at analyzing how authors trick us, so to speak. She’s pretty sharp. So when we discussed Jackson’s books several times over the last couple of years, Megan brought up elements of her writing that I had just never thought about before. From her nuanced depiction of women’s lives and psyches to her slippery use of language to create ambiguity, I was suddenly thinking about someone who I’d professed was one of my favorite authors totally anew. It was delicious and informative and I felt like I was getting to know a book friend and a life friend better. Megan is also better versed in older films than I am (although I try), so in December we watched two film adaptations of The Haunting of Hill House. The good version and the new version. (You can read her review at Review to Be Named). Then, in January, when I took a study break to talk books with her over a glass of wine. She told me some great news: a bunch of Shirley Jackson’s out-of-print novels were being re-released. She had already read some of them and they shot to the top of my post-exams reading list. When a group of friends and I went out to celebrate my birthday and passing my exam, Megan gave me an incredible present: The Road Through the Wall, Hangsaman, and The Bird’s Nest in a single volume, published by a book club in 1998. I love it not only because I get to read these books, but because it fits so beautifully on the shelf with my other Shirley Jackson collections from the 1990s. And I get the important added benefit of having someone to talk about the books with. Grad school has been hard on my love of reading. For all the talk about the value of loving your work, I think sometimes the frustration of the daily grind can chip away at the passion that got you into that grind in the first place, if you’re so lucky to have gone into a career for love. I wasn’t always good about making time to read just for me, even though the times when I did (such as the day I spent reading “just one more chapter” of Gone Girl until it was midnight and I’d finished the book) I felt recharged. Anyway, if there’s a take-away from these thoughts it’s that, despite the image of the introverted reader with her nose in a book or the literary scholar locked away in a dusty office, like in anything, sharing pleasures and discussing one’s thoughts sustains relationships, between people, other people, and their books. Sharing things helps us learn and keeps us from living in a self-satisfied, uncritical bubble (which sounds good, but not really). Appreciating good art takes a good eye and sometimes another perspective. In a sense, that’s what we lit majors do all the time, but having spaces carved out just for the joy of reading and of friendship is worth its weight in hardbacks.